The versatility of Rory Williams has been hailed by Hawks assistant manager Shaun Gale. The former Gosport Borough man’s ability to switch between the wing-back and full-back roles on the left-hand side has provided boss Lee Bradbury with a massive boost as the club bids to stay in the National League. 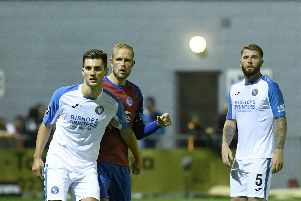 It is one reason why the Westleigh Park manager has been able to switch between playing a 3-5-2 formation to a 4-4-2 system in the Hawks’ maiden season in the fifth tier of English football. Gayle lauded the player’s adaptability since his move to the club in the summer of 2016. He said: 'Rory has been fantastic for us. 'He has a terrific attitude, is a winner and been very influential in our success in recent seasons. 'Rory possesses a quality left foot and great pace. 'He is also a good defender. 'This enables him to take defenders on both on the outside and by cutting inside. 'Because of his fitness and pace he is able to play both the full-back and wing-back roles. 'He gives us a great attacking option down the left and has recently built up a great partnership with Will Wood. 'It is great to have two naturally left-footed players in the team. 'This gives us a nice balance and when one pushes forward the other can sit in behind him. With Accrington Stanley loanee Wood suspended for the next three games, Williams is likely to drop back into the full-back role.